Taking on a turkey can be one of the most overwhelming tasks of the holiday season. Every year we get a flood of questions regarding pellet grill capacities, methods, pellets, proper thaw times, cook times, and more. We’ve compiled a few helpful turkey tips and tricks for preparing and cooking the perfect bird—a main dish that all your guests will want to gobble up. Don’t forget to add a few delectable side dishes to complete the meal! How Many Turkeys Can I Fit On My Pellet Grill? How Big Of A Turkey Can I Fit In My Pellet Grill? When/How Do I Thaw My Turkey? Keep the turkey in its original wrapping and place it in a fridge set to 40 degrees F or below. You can typically account for 6 hours / pound. 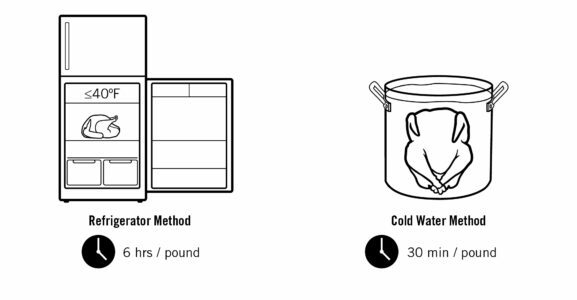 In its original wrapping, submerge the turkey in cold water. Replace the water with cold water every half hour or so. A large sink or bucket works well for this method. You can typically account for 30 minutes / pound. 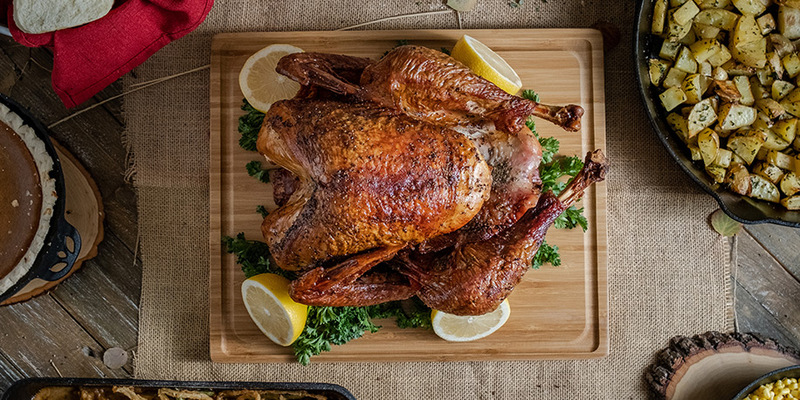 Should I Wet Brine Or Dry Brine My Turkey? 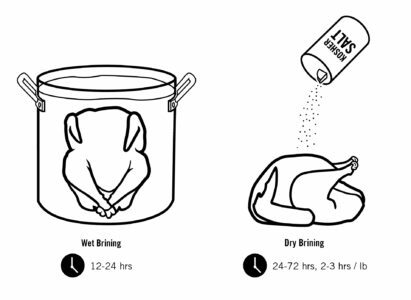 Wet brining consists of submerging the turkey in salt, spices, and water for an extended period of time. This process will typically take between 12-24 hours. Pro: Infuses both flavor and moisture. 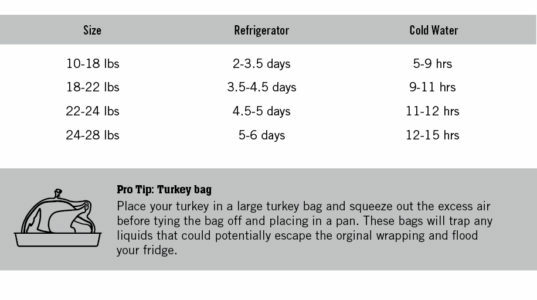 Con: Requires a large container for the turkey, or a durable brine bag which can take up more space in the refrigerator. Dry brining consists of rubbing the salt and seasonings directly onto the meat and skin. Then letting it rest for a period of time. This process will typically take between 24-72 hours, 2-3 hours / pound. Pro: Simple and requires less space than wet brining. The salt helps keep the turkey moist and adds flavor. Con: Requires more time when done right. How Do I Truss My Turkey? Start by placing the twine around the back of the turkey. As you bring the twine around to the front make sure to pass overtop the wings, which will help hold them in place. Run the twine along the leg joint and criss cross it under the ankles. Pull snug and criss cross the twine under the front of the bird. Cross the ankles and wrap the twine around them, criss-crossing it on the underside of the ankles. Tie off the twine with a simple double overhand knot and trim the excess. How Do I Spatchcock My Turkey? Cut down both sides of the backbone. It’s easier to cut through the joints if you stay close to the backbone. Turn the turkey over and firmly press down on the turkey breast. The breastbone should snap, allowing the turkey to lay flat. What Variety Of Pellets Should I Use For My Turkey? How Long Should I Cook My Turkey? 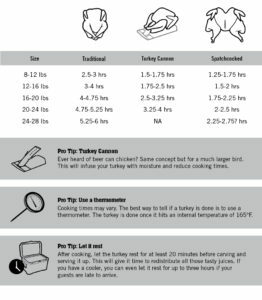 There are many variables that can determine the amount of time it will take to cook a turkey; such as what method you’re using (traditional, turkey cannon, or spatchcocked,) the temperature of your pellet grill/oven, outside weather, and even things like the temperature of your turkey before you start to cook it. See below for some rough estimates and comparison between methods. 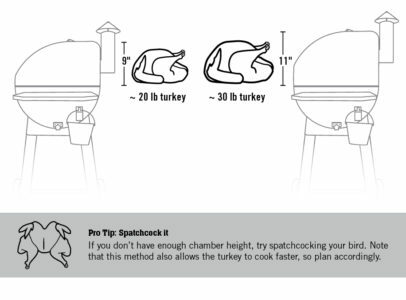 Chart reflects cook times for a pellet grill at 325 degrees F.
Remove the leg and wings by cutting at the join where it meets the body. Lift out the entire breast and slice against the grain. What turkey tips do you have? What side dishes will you pair with your turkey? Let us know in the comment section below! It would be great to get some tips on smoking/roasting a 4-6 lb turkey breast. We’re a small family so we won’t end up getting a whole turkey but just a breast. Any differences from the tips above other than a shorter cooking time? For a small bird that size I would keep the thaw times the same (Refrigerator: 6 hrs./lb. or Cold Water: 30 mins./lb.) Brine to your liking, then set your Camp Chef pellet grill to 325°F, and cook for and 1.5 hours to 2 hours. Be sure that your turkey reaches an internal temperature of at least 165°F before pulling it off. Let it rest before serving. One thing we want to note beforehand – you likely won’t be able to stuff your turkey due to the size. But like we said above – that doesn’t mean you have to go stuffing-less! Spread it out on a sheet pan and place on the rack directly underneath your turkey. You’ll get all sorts of flavor from the drippings. Good luck and happy smoking! Great info but what temp should I set my campchef at? The chart reflects cook times for a pellet grill set at 325°F. Thanks for the heads up! Great article. I am going to be using turkey breasts this year, I assume the cooking method will be the same. Of course I will be using a meat thermometer to be safe. I really enjoy my pellet grille and love the flavor it adds to any dish. What a great idea for those that don’t want to commit to a full bird! We’re so happy to hear you love your Camp Chef. Enjoy! My wife and I are “into” the roasted turkey breasts that are sold next to the pre-cooked roasted chickens at our local supermarket. We buy them regularly. But reading that turkey breasts can be smoked easily in less than two hours, encourages me to do my own at home. Yes! Using the spatchcock method or a turkey cannon will save you a ton of time. This is my first time smoking a whole turkey too so I plan on doing a test run this weekend. Best of luck! I love my camp chef smokepro!! I’m going to attemp a full 20 pound turkey this thanksgiving. Per your recommendation of 325F will the bird get a good smoke? Will the smoke penetrate enough into the bird to give a good smokey flavor? We’re happy to hear you love your SmokePro! Yes – we just tried both the turkey cannon and spatchcock method today at work and had great results. A gorgeous crispy outer skin followed by a juicy flavorful chunk of meat. The smoke wasn’t overbearing by any means, but I could definitely tell it was different than an oven baked turkey. So much flavor! Will there be any issue using the Turkey Cannon with a 9 or 10 lb turkey breast? Nope, you’ll be smooth sailing with a 9-10 lbs. whole bird! For reference we’ve used the Turkey Cannon with birds ranging from 4-18 lbs. My wife and I smoked a turkey breast to test our smokepro for Thanksgiving. We used a wet brine overnight, and then put on a rub of our own creation. We put the smoker on high smoke and smoked the turkey breast for 7 hours. For the last 30 minutes I turned it up to 300 degrees. After letting the breast rest I carved into it and was very happy with how juicy and tender the breast was. It was so nice to put the turkey in and then leave it to do it’s work. We found our favorite way of preparing a turkey. Thanks for sharing your success story – that sounds yummy! HI Rachel, I will be doing 2 14lb turkeys, one stuffed with pre-cooked meat stuffing, the other unstuffed. I do high smoke for a couple hours using apple/cherry mixed pellets then crank up the heat to 325 until the birds reach 165. My question is, will the birds cook evenly or will the stuffed bird take longer/shorter time. If so, any idea on the time difference.I have smoked a turkey on my Camp Chef and it was incredible and so juicy even though I do not brine. Thank you and Happy Thanksgiving. In our testing we have found that a stuffed bird will take a bit longer to cook since the stuffing needs to absorb the heat. A stuffed bird that size might take an extra 15-20 minutes compared to a non-stuffed bird. However, we suggest using your probe to keep an eye on internal temperatures. We are so happy you’re enjoying your Camp Chef pellet grill. Wishing you have a safe and tasty Thanksgiving. This is the first time I have smoked a turkey. With that being said what type of spices are the best to brine it with? We are very excited to be on this journey with you! If you were to ask our in-house chef he would tell you,”salt, pepper, and smoke the heck outta’ it.” So, if you’re in a pinch-you can’t go wrong there. But, realistically there are endless options based on personal preference. Dry or wet brine? Last week we did a dry brine using salt, pepper, Camp Chef Citrus Herb Seasoning, and a little butter. (If you have Facebook head over to our Facebook page to watch.) It turned out great! Crispy skin with a tender, juicy inside. Still thinking about how tasty that was! With it being your first turkey I might suggest doing a run through with a smaller turkey or even a chicken to get the general gist of it. Thanks for choosing Camp Chef and best of luck on your first turkey! What would you recommend for a wet brine? I want to cook 2 turkeys on our Woodwind SG. 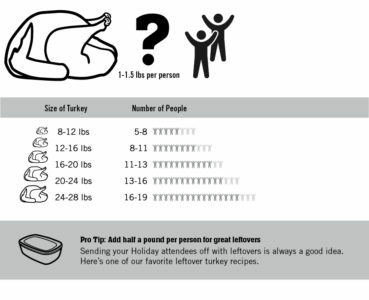 What is the largest size of turkey you recommend for 2 turkeys. This will be the first time for Turkeys. 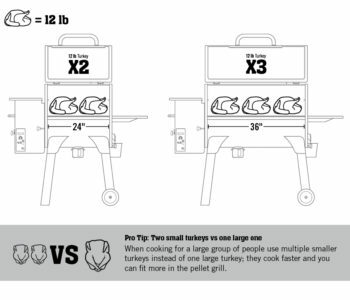 https://www.campchef.com/blog/your-guide-to-the-perfect-turkey/#how-many-turkeys-can-i-fit-on-my-pellet-grill. Two 12 lb. turkeys. What’s the best way to put a drip pan under the turkey on a Woodwind smoker? How do you deal with the slanted drip tray – do you remove it, or prop it up on one side instead? Thanks! Depending on the method you use there are a couple ways. Turkey Cannon: Just place a drippings pan on the bottom self and place your turkey on the turkey cannon inside. This will catch the juices. Spatchcock: Place drippings pan on the bottom shelf. Place your turkey on the top warming rack shelf. I was planning on using my turkey cannon and smoking my 14lb bird at low smoke. Approximately how long do you think it will take. Your chart shows time for 325 not 180. I am just trying to time everything and this is the first time I’m using the cannon. Maybe 6hrs? Thanks. To be honest we haven’t tested smoking a turkey on the turkey cannon at 180 before. You could probably sneak in a test run before the big day. Let us know how it goes! I’m looking forward to trying my woodwind on a 20 lb turkey. I’m considering injecting rather than brining. I plan on using a roasting pan with the bird to collect the juices for gravey. I’m using a really good cajun dry rub that makes great gravey. Will using a pan effect the length of time it takes to cook the turkey. Sounds great, let us know how it turns out. A roasting pan should not change your cook time drastically if any. If you were to enclose the bird in another pot with a lid that would be a different story. Can you make this guide a printable version please? I will pass this on. Thanks. I am have ing a great time exploring this wonderful new world of smoking! Our family purchased a 36″ smokepro this summer and have made some of the best tasting bbq. Thank you Camp Chef for making such a useful tool. I am going to try smoking a Turkey for Thanksgiving. While excited, I am nervous about the cold temperatures affecting the cook time. I will be spatchcocking my Turkey (16 lbs) to shorten the cooking time as much as possible. Do you have any other suggestions for smoking in cold weather, mid teens to low 20’s? We are ecstatic that you love your 36-inch Camp Chef. We are located here in Utah and know all about smoking in cold temperatures. While it won’t arrive on time, a pellet grill blanket would be a great investment. It’ll help you burn through less pellets during the winter time. Best of luck on your first Thanksgiving turkey in the Camp Chef! I have used the turkey cannon in the past for about an 18 lb turkey. It works ok for that size but I have found that getting the bird to stay on the cannon is a bit difficult. This year I have a 22 lb turkey, will the cannon handle a turkey that large? If not is it ok to cook directly on the grate or should I put it in a pan with onions, broth, carrots, and other seasonings? Also I put the smoker on high smoke for about 30 minutes (this year I want to for 45 minutes), does this help with more smoke flavor or should I just do 325 the whole time? We’ve tested our Turkey Cannon on birds raining from 4-18 lbs. I think a 22 lb. bird would be pushing the Turkey Cannon’s capacity.